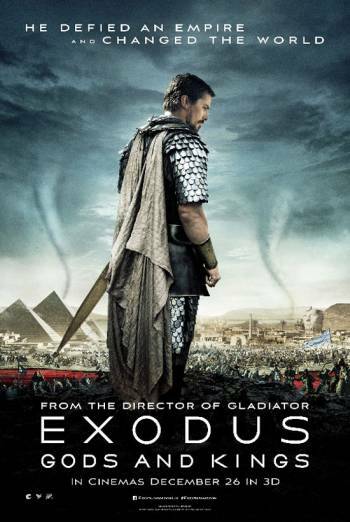 Summary EXODUS: GODS AND KINGS is an adaptation of the Book of Exodus, in which Moses leads the Israelites out of slavery in Egypt. EXODUS: GODS AND KINGS is an adaptation of the Book of Exodus, in which Moses leads the Israelites out of slavery in Egypt. There are some large-scale battle sequences, in which arrows are fired and fighters clash with swords. There is little blood or injury detail, although the action is noisy and fast-paced. At one point, a sword is seen sticking through a man, but the impact is largely blood-free and the image is not on screen for long. There are occasional scenes in which people are hanged from scaffolds. The hangings are brief and there is no focus on injuries or suffering. There are moments of moderate threat throughout. The strongest occur when various plagues descend upon the people of Egypt, in particular when the first-born sons of every household are killed by a dark cloud creeping over the land. Children stop breathing in their sleep and their parents are distraught, cradling their bodies. Later, as Moses and his followers cross the Red Sea, the waves engulf the pursuing Egyptian army. There is some sight of injuries, including when slaves are whipped and when a broken leg is tended. However, there is no emphasis on such injuries. In one scene, people are attacked by crocodiles, resulting in significant blood loss into the water. However, there is no clear injury detail. Occasional animal action, including horses falling onto their sides, keeling over exhausted, and dying was achieved using digital effects. No animals were harmed.